Before embarking on my first journey to India I was completely unprepared as to the ways of the country. Since I was invited on this trip, I was relying on the expertise of my traveling companions, who had been researching this trip for over a year. I decided to just concentrate on giving a good concert in Mumbai, and work on not getting lost before meeting up with my friends a few days later in Northern India. It was the day of departure, I was in the JFK airport walking toward the security checkpoint of the Air India terminal, armed with a small thin booklet on Indian Buddhist sites and a last-minute printout of the Wikipedia article on the Indian train system. I saw a mass of Indian people crowded in front of the checkpoint area. Two airport security people directed the traffic, checked tickets, and yelled instructions over the hum of the crowd. It looked like complete chaos. A long line cluster wound down along the duty free shops. How could there be so many people waiting to board my flight? I was two hours early. A young Indian couple stood in line in front of me with their luggage. Two other couples came and talked to them, kind of standing in line also, then another couple. When I tried to make room for them in the line, they declined. It wasn't long before I realized for every person traveling on the plane, there were 3-7 people there to see them off, to keep them company while the traveler waited in line. The goodbye crowd continued talking to their traveling friends after they were well into the security line. When they got to be out of ear range, they would continue to communicate with body language. As travelers advanced in the security line, they would turn around periodically to wave back, or make animated body gestures at their friends. The last communication would come when they pass the security check point with belts and shoes in hand. There they would turn toward their friends, put their belts and shoes down, and give a final two-armed wave goodbye before picking up their belongings and heading toward the gate. I had a feeling then that I was going to like getting to know Indian people, and I was right. When Indians meet you they seem to accept you as a fellow human being on the big journey of life. I found them always enthusiastic and patient in explaining to me the ways of their country. All the way from Mumbai to Bodh Gaya to Varanasi, Agra, Dehli, I was met with the same curiosity, the same patience, the same enthusiasm. There is a resilience in their nature that can be best summed up by their favorite saying, "OK. No problem." I heard this everywhere in India. Sometimes I would think, oh, but it IS going to be a problem. But they would inevitably figure out a way to get around it somehow. Maybe it's their long history, maybe it's the crowded environment, maybe it's their belief in reincarnation, but one got the sense one was part of a much larger picture and momentary set backs were just that, nothing more. The fact that the cow is holy and free to roam adds a completely different dimension to life. 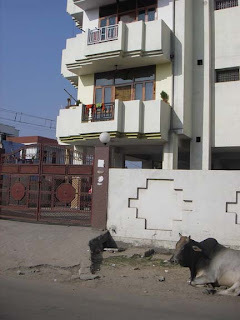 After returning from India, I distinctly remember the first time stepping out of my New York apartment feeling rather disoriented by the realization that there will be no cow passing by our front door, or parked next to the motorcycle, or munching on my downstairs neighbor's windowsill plants. I remember standing in front of the apartment building reprogramming my commuting instincts, taking out the cow factor completely, and feeling a little sad about it. Why? Sure, it's inconvenient to have a cow get in the way of one's rushed commute to work. But accepting the cow's existence, and the probability of the cow mixing into one's daily commute, somehow implies the acceptance of divine intervention. Maybe it's this acceptance that makes Indian people say "OK, No problem" to some of the most tedious and daunting tasks. 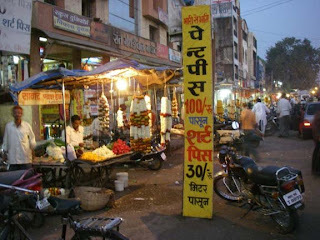 Shopping in India is very different in that aside from restaurants and trains there is no set price to most goods and services. It took me about half the trip to get used to the custom of haggling. The differences in prices can be startling. A street vendor offered me a portable chess set with intricate wood inlay for 5 rupees. Later I saw the exact same item at the State Emporium being sold for 660 rupees. Taxi drivers and rickshaw drivers almost always try to negotiate a high price up front. Maybe because we are such obvious tourists, sometimes they would ask for more than twice the usual price. During negotiation these rickshaw drivers could be fierce, looking insulted by the fee we offer, talking about their family they need to feed, making us feel we're robbing them of their daily nan. However, once the price has been negotiated, they never try to ask for more at the end of the journey. In fact they often become quite friendly during the drive. We did have a couple encounters with private drivers, however, who at some point in the drive would ask for more money than was originally negotiated by the travel agent. It was a little off-putting because we were already in the car and felt a bit trapped. After experiencing this twice,I decided while negotiating a boat tour of the Varanasi ghats, that it was crucial to have both the negotiator and the boat man together when talking about the fee, so that we can eliminate any discrepancies from the beginning. I asked repeatedly to be assured that there would be no hidden fee, and complained to the man negotiating that since arriving in India I have had trouble understanding this particular custom of hidden fees. The man said, "Lady, all the fingers on the hand are not the same length." Hm. It's true. To some extent I was asking him to change his culture to cater to my sense of justice and well being. I live in New York City, the most diverse existence one can chose in the US. But to some extent, I still live by the one-size-fits-all mentality that tries to squeeze everyone into the same cookie cutter mode. I cannot help it, because everything to some extent is mass produced here, medication, food, entertainment, information, education. Everyone's worth is measured by how much money he or she makes. Everyone's intelligence is measured by what is called an I.Q. test. Everyone should be on the same diet, dictated by the latest scientific findings, never mind that they keep contradicting one another. But it doesn't seem to be this way in India. In the 20 days that I was in the country I did not see one super market, only farmer's markets. The result of this particular form of diversity was most welcome by all of us. In the 20 days that I spent in India, every meal was made with the freshest ingredients, and my digestive system couldn't have been happier. It was a little difficult to get used to at first because the produce had so much more flavor. It took a while before I realized that it wasn't any particular spice that was enhancing the taste of the raw cucumber. It was the flavor of the cucumber itself that came through so strongly, with fragrance and subtleties in the taste. The same was true for tomatoes, yogurt, grains, oranges, etc. to what looked like post boxes on the side of the road. This particular orange deity had even the locals guessing. Shop keepers often had small alters in their shop where they take time throughout the day to say their prayers and make offerings. The time to pray seems to begin from daybreak and go until nightfall. 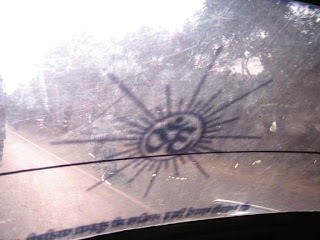 Taxis and rickshaws had images of their deities or gurus of choice either hanging from the rear view mirror, or pasted on their windows. Judging by the garlands of flowers for offerings being sold on this street, my guess is some people make more than one offering a day. Whether one practiced various forms of the Hindu, Islam, Buddhist, Jain, Zoroastrian, or other religions, there seemed to be one unspoken agreement amongst all Indians, and that is the basic human need for spiritual practice. Wherever I went in India, people seemed to recognize and respect the need of others to practice their religion, whatever that religion may be. People also seem rather knowledgeable, if not, at least curious about their neighbor's religions, often because their temples are right next to each other. Pictured below are candle prayers at the huge Buddhist stupa at Sarnath. In the picture one can see the tip of the Jain temple right next door. Above, Muslim school girls, Buddhist monks, tourists from all over the world visit the place where Buddha gave his first sermon. Vinny and I had a chance to visit the Sarnath Jain temple, located right next to this landmark Buddhist stupa. The Jain priest at this temple gave us a very brief idea of the Jain religion. From our brief conversation it was evident that he knew also quite a bit about Buddhism, and showed no disdain nor any particular aversion to other religions. Honoring the human need for spiritual practice and worship and accepting religious diversity, this was to me one of the most impressive traits of the Indian people. It may be the key to why they can live in harmony and how they can meet each new task with the phrase, OK, No problem. After my concert in Mumbai a lady at the reception told me that if I went to Agra to see the Taj I should also visit the palace at nearby Fatehpur Sikri, which was also quite beautiful but not as well known. The idea of a ghost town with an abandoned palace intrigued me, though I had great difficulty remembering the name. When I met up with my companions I told them I wanted to add Fate. .. Fateh. . . . something, to our itinerary. We went through a lot of city names that started with F before figuring out which one it was. Then we decided to add F.S. to our Taj Mahal day. 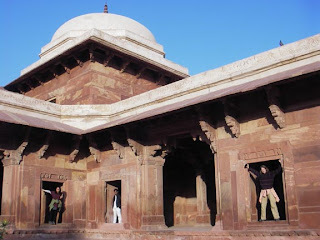 After spending the morning at Taj Mahal, we hired a car and headed for Fatehpur Sikri. We had limited time, maybe a couple of hours at the palace, so on the way I read to my companions the descriptions of the palace sites and historical intrigues from the Lonely Planet Guide to India. This way we could go and have a look around on our own without having to hire a guide, and maybe save some time. The driver dropped us off at the parking lot, and immediately we were approached by a guide for hire. We tried without much success to tell him we were not looking for a guide. He just kept following us, trying to talk Vinny into hiring him for the afternoon. We tried to walk faster so that he would stay behind, but he kept coming along. There were no signs to tell us which way to go to the palace, and we didn't want to give the guide any indication that we needed a guide, so we just followed some people who ended up going into a hotel type place. I asked the guy sweeping the floor there where the palace was, and he pointed to a hill across the road. "Behind the trees," he said. There was no path leading up the hill so I was kind of confused. Then he said we could either take the road to the right or or to the left to get to the place behind the trees. When we got to the road we looked both ways, no signs, no sign of entrances either way. Hawley decided, why not go straight? Cielo and I agreed. We were still trying to lose the guide, so we crossed the street quickly and walked straight into this abandoned field with the intent to hike up the hill to where the trees were. Vinny, who was wearing all white, said he would go around and find a path and meet us at the palace. I turned back and saw the guide with a look of confusion on his face as he watched us take our "shortcut." He did not follow us anymore after that. There were some goat herders nearby, but they did not pay much attention to us. No more than 10 steps into the field, Hawley got snagged by a huge dried thorn bush. Cielo and I were both pricked by the thorns as we tried to dislodge its tight grip on H's pants. Already, it was looking like a strange adventure. But we were short on time, so we forged ahead. After climbing up the steep dry hill I saw the horns of a cow float across the top of some bushes, then some hats of school children, and their teacher. . . indeed, there was a paved road up there. We got to the road and decided to cross it and go beyond where there was an official looking building. There we found a cliff looking down at a few houses. There were no signs on the building, and it seemed closed. Hm. . . maybe not here? We turned to the right and kept walking, but it was looking more and more desolate with brick ruins here and there. Nothing palatial, mostly overgrown with weeds. Could this be it? No one was around to give us directions. Hawley and Cielo got a little ahead of me as I stopped and looked around for someone to ask directions. Just then a yellow dog came up behind me and stopped to say hello. Half in jest I asked her if she knew the way to the palace. She listened to my question, then made a gesture with her body that clearly said we should be headed in the opposite direction. Having received such a clear answer, I suddenly found myself doubting that one could actually ask a dog for directions. Just then two men passed by and when I asked them, they confirmed what my new canine guide had just told me. I gathered my companions and we followed the dog back to the road and took it all the way up to the front gate of the Palace. She went inside through the garden into the main courtyard and made a small circle and settled down right in the middle of the square, her job finished. At last, we were at the fascinating red palace of Akbar the Great, a very unusual emperor who ruled with surprising religious tolerance, and who had great appreciation for the arts. 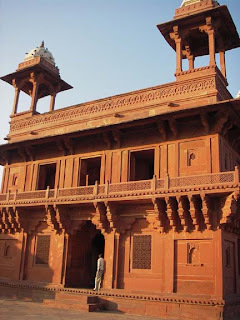 One of the first buildings we saw was the Diwan-i-Khas. Inside there was a big column in the middle with lots of carvings. Above it was a circular space, almost like a podium. This space is connected by four narrow walkways to the four corners of the building, each with a smaller podium supported by a column. 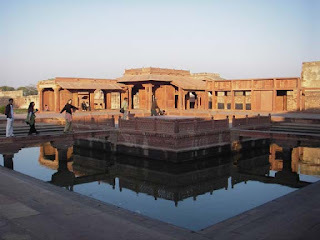 If I understood the guidebook correctly, this is where Akbar used to have debates on religion with learned scholars and clergy of various different religions. He stood in the middle, while the others stood in the four corners, sometimes representing four different religions. I wish these discussions could happen again, different religious leaders gathering together, with respect and curiosity for one another's religion. But instead of debating about religion, they gather to find a way for everyone to co-exist, to outlaw violence in the name of religion, to find solutions for peace on this crowded planet. Everything was built with huge slabs of red rock. There was an interesting building with many layers, each layer getting a little narrower, and supported with elaborately carved columns. Supposedly each column had different carvings on it. The guidebook mentioned something about placing the Akbar's harem on it, layer by layer. But it was a bit unclear what the purpose of that would be, other than to amuse the architect. There was a pond with a square platform in the middle, with four narrow bridges leading from the outside to the platform. First chance I got, I went and stood in the middle of the platform. It just seemed like the thing to do for whatever reason. It looked to me like a place to stand in order to receive inspiration. Besides, I was text-messaging Vinny who had gotten separated from us, and this also looked like it might be the place with the best phone reception. I didn't read about this structure in the guidebook, but it was the one that fascinated me the most. When I got home, I read about it online. It seems that Akbar had a musician in his court by the name of Tansen who is supposedly the most famous musician in Indian history. He had the ability to conjure rain and fire with his singing. According to legend Tansen died in one of the fires that he had called forth with his song. 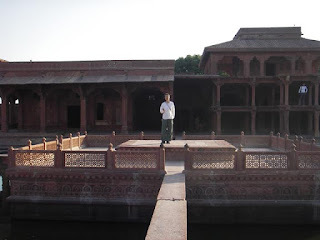 The platform in the middle of the pond was where Tansen performed for Akbar and his court. Hm. . . with his pyro tendencies, it's no wonder his stage is surrounded by water. The sun was getting lower on the horizon and it set the red stone buildings ablaze. They must have done special rituals at this time of day back in the day of Akbar the Great, because the palace square looked magical, like a ghost town on Mars. The Taj Mahal was one of the last places I visited in India. 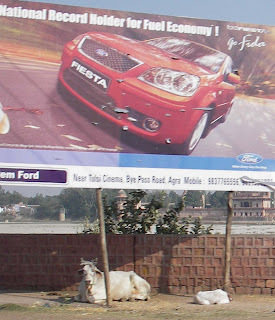 Before taking this trip, it was the only image that I associated with India, probably because all the tourist ads use it. After being in India for a couple of weeks I realized that the Taj is quite extraordinary, even in the context of India. We decided to start the day early by watching the sunrise at the Taj. When we got to the gate, we found out that entrance fee was 20 rs for Indians, and 750 rs for foreigners. We asked if we could step out to have breakfast after seeing the sunrise, then go back in and explore some more. We were told that we could perhaps step out for a chai, but definitely not long enough for breakfast. How the guards would be able to calculate the time difference between our having a chai and a full breakfast, I was not sure. Gut feeling said skipping breakfast would not be good, so we decided to be different from the everyday Taj Mahal tourist and try to see the Taj sunrise from outside Taj Mahal. 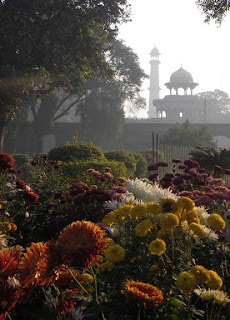 Taj Mahal and it's gardens is encased by a stone wall with huge gates. 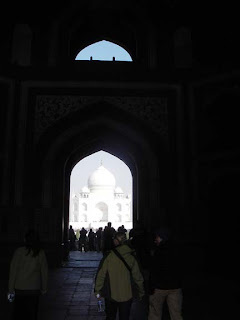 We walked along the Eastern wall on our quest for an unusual view of the Taj sunrise. There was no one on the road. All the tourists were inside the wall, catching the regular (but probably quite spectacular) Taj sunrise and probably being hungry. Along the way we saw a colony of monkeys having breakfast on the side of the road. They paid little attention to us walking by. At the end of the road was the Yamuna river where we were greeted by two guards with rifles. 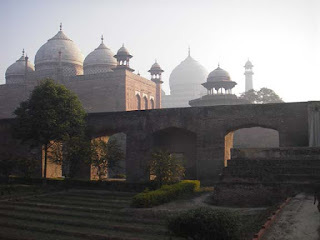 There was a small lawn behind Taj Mahal, fenced in by barbed wire. It was cold and foggy this morning. There was a thick fog rolling just above the river at a slightly faster rate than the river itself. A boat man was on the river, slowly pushing his boat from shore with a pole. I attempted to use the video function on the camera to pan the river and the Taj, but the zoom was frozen by the cold, and I got only partial view. 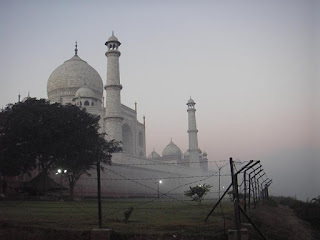 It suddenly dawned on us that in order to see the Taj Mahl against the sunrise, we needed to be on the West side of the Taj Mahal. We saw a narrow path along the river that would lead us directly to where we want to go. However, the guards informed us we were not allowed to take this path. So instead of getting to our desired vantage point in two minutes via the direct path, we had to go back the way we came, walk by the monkeys who had since finished their breakfast and began their morning exercises, go all the way around the enclosed Taj grounds through various neighborhoods, accidentally walking into people's driveways, running into some parked camels, a few cows, a menacing dog, etc. Finally a man brushing his teeth outside his house saw how lost we were, and without our asking, pointed us in the right direction. After more twists and turns, and almost being run down by four galloping camels, we finally got on the road along the West wall of the Taj Mahal. A man came by and asked us if we wanted to see the best view of the sun rising on the Taj Mahal. Indeed, this is what we were looking for! But experience told us to show only mild interest. He said he would willing to show us the way for 400 rs. Ah, beyond our budget, we told him, but took note of the side path he pointed to as we continued walking North toward the river. On the side of the road was a middle aged business man in a long fancy wool coat, feeding some buttered toast to an extremely emaciated stray dog. The ribs on this dog looked like they were about to come out of his skin, but he was looking extremely happy to be receiving such a feast. As we got closer, the man saw us, looked embarrassed, and walked away from the dog who was busy finishing his toast. I didn't understand why the man should feel embarrassed. I never quite figured out the relationship between Indian people and their dogs. It's clear dogs are not considered holy like cows. Nor do they seem to be considered dear pets or best friends of humans like they are here in the US. In my 20 days there, I only saw one child playing with a dog. The rest of the time, there seemed to be very little interaction between humans and dogs. But there were many dogs running around, so someone must feed them. 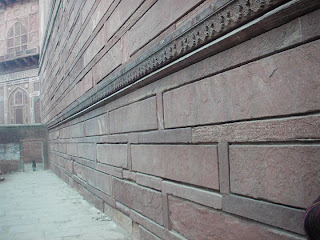 The wall around the Taj Mahal is impressive, built with red stone. I tried many times to photograph it using different angles to show its grandeur, but somehow in pictures it looked quite flat and ordinary. Finally I found a good angle that included a gate, but it did not show just how big those red stone slabs were. What I needed was for someone to walk through that gate, I thought, as I looked through the view finder of the camera. Just then, another dog showed up at the gate. I yelled out, Hold it! Wait! Stop right there! Let me take this picture! Much to my delight, the dog granted my request. We got to the river, where we saw the Taj against the sunrise. There is something very quieting about watching the glow of the sun rise behind a huge white marble mausoleum. A man stood by the river, praying and making offerings to the river. In the river there was a wreath of marigolds, someone else's prayers and hopes perhaps. After taking some photos, we decided to go back and explore the 400 rs view. The man who offered to guide us was no longer around, but we took the path he pointed to, which led us to a garden. Here I was chided by my companions for my third missed Pentax moment of the trip, a camera shy peacock strolling through the rose gardens next to the Taj Mahal. But I'm sure the image of it in your mind right now is far better than anything I would have taken. Some steps along the West wall of the rose garden led us to a nursery, with rows of hedges and flowers. The guard there came by and told us these flowers and hedges were grown for the beautifully manicured garden grounds around the Taj Mahal. So in the end we got quite a few special views of the Taj sunrise. After breakfast, we went inside the gate. By now it was very crowded. There were three or four rows of photographers and videographers, amateurs as well as professionals judging from the wide array of imaging equipment, all crowded just in front of the long pond in front of the Taj Mahal. On their faces were frozen expressions of eagerness and of wonder as they fixed their gazes and their lenses upon the superstar of monuments, speaking in hushed tones. It was odd, almost as if they were afraid to disturb their subject. Within a few moments, the professionals started to pack up their equipment, and the crowd started to dissipate. The fountains in the pond had been turned on, no more reflection. Oy, I thought to myself, the fourth missed Pentax moment. One of the reasons the splendor of Taj Mahal is so much more impressive in person is because it is huge, much bigger than pictures can show. In order to take a photo of the entire structure, you have to be standing very far away. If you're standing close enough to be seeing the details, you can only take one small section of it in the photo and no one can tell where you are. When I see a picture of people standing at the Taj, I can't help but measure the size of the body compared to the size of the monument built to commemorate its passing. According to the story, Shah Jahan's beautiful wife Mumtaz Mahal died giving birth to their child, and this was his way of remembering her. They are both buried inside this mausoleum. On the entrance of the tomb there is huge thuluth script quoting passages from the Qur'an. It has not faded in hundreds of years because it is depicted with stone inlay. 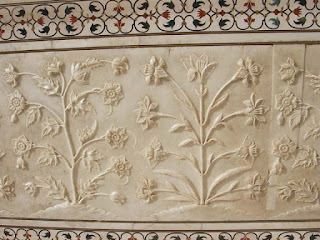 The flowers carved onto the marble panels look quite familiar to me, like tulips, daffodils, and inside the tomb more tulips and iris. But the stalk and leaves of the plants don't really match the flowers I know, so I'm not sure what these flowers are and why they accompany Mumtaz. Most sources about these carvings just say, plant motif. Inside the tomb it was crowded with tourists and very dark, so I could not see too much of the details or colors of the carvings. In the center is Mumtaz. I wondered how she would feel if she knew that everyday people from all over the world would be visiting her grave? 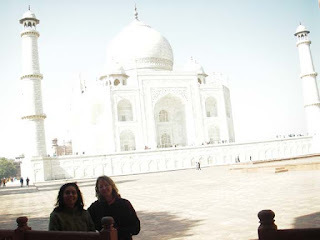 Next to her is Shah Jahan who died many years later. 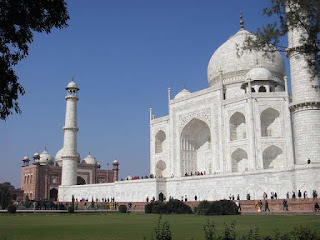 Scholars talk about Shah Jahan's obsession with symmetry in the building of Taj Mahal. I wondered if he would be upset by the fact that his grave throws this symmetry off? At the end of his life Shah Jahan was imprisoned by his son in the Agra Fort where it is said he had a view of the Taj. On a sunny day the reflection from the white marble outside can be blinding. Much thought has been given into how to preserve the white. The city is trying to reduce air pollution by limiting factories around the Taj, and by having special fuel efficient auto rickshaws. Visitors to the mausoleum are asked to either remove their shoes, or put on white paper shoe coverings. An hour at the Taj can give you an impressive tan with all the reflective surfaces. Of course, wearing a bikini to a mausoleum is probably out of the question. It is very soothing and peaceful to sit on the white marble floor and watch the 10 or 12 hawk like birds play flying games around the big dome and it's towers. I can't imagine that they were there to feed on anything living on the white slippery marble domes. They would all fly up at once and go round and round the big dome, then rest again. Maybe the contour of the domes create amusement park like air currents. Our visit to the Taj ended with my fifth and last missed Pentax moment of the trip, a monkey chase on the white marble grounds of the mausoleum. This looked more like a life or death chase than fun and games. Both monkeys were very red with their fur all standing on end, teeth flaring. I never knew monkeys could run so fast. They covered the length of the white marble grounds and disappeared into the garden before I could pull out the camera. Click on video to play. Double click on slideshows to go to Picassa to view it in larger format.